Your very own cabin on the lake. Kayak, swim, fish or simply relax. When you arrive at Awesome View you know you made the right choice. The home is well cared for and ready for you and your guests. The shaded, upper main deck with cabana has a great view of the lake. Grab the kayaks that come with the home and hit the lake! This is the upper deck off the house, attached is the covered are with fans and lighting. One needs venture no further! 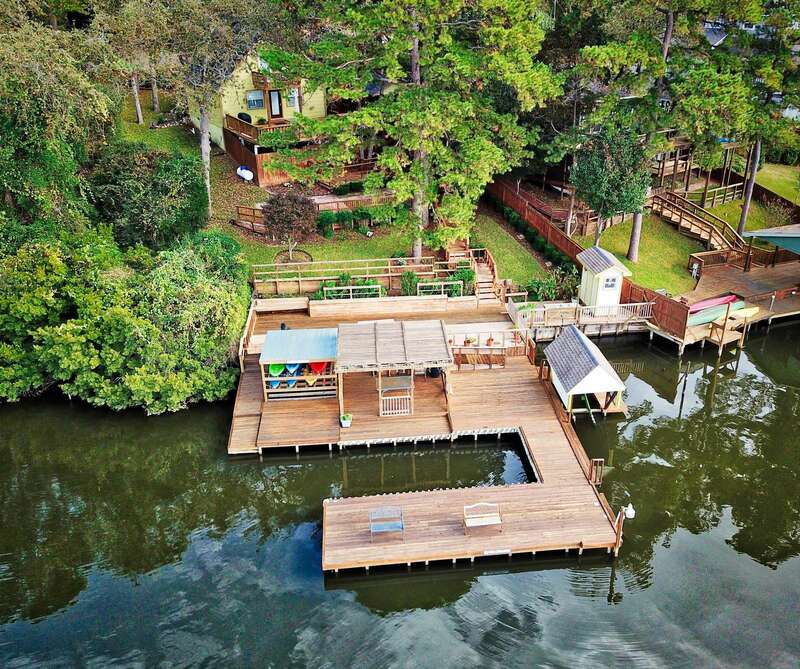 You have your own huge dock with a boatslip, shade cover, swim area and lake!! Head out to the swim platform thats a short distance from the main dock. Kayakers from our other homes enjoy the lake. The large dock and peacful quiet setting make A.V. a unique home. 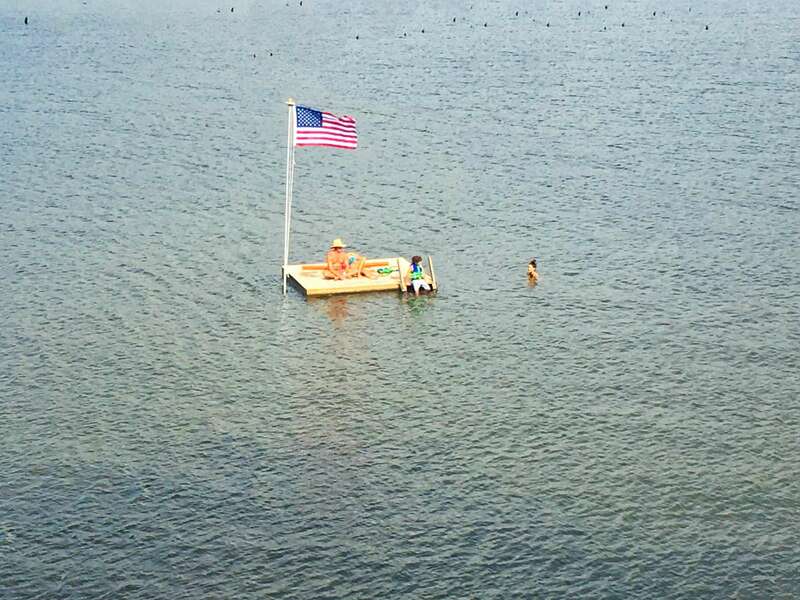 A family enjoying the swim platform. Theres nothing better than watching your kids catch a fish, it's even better when it's their first. We can offer tips to help. Awesome View is an incredibly beautiful property. Huge decks and meticulous landscape set the stage for that perfect getaway. The cover at the upper deck has fans and lights. It's a great spot for a meal or to simply relax and read a book. The view off the main deck is stunning. We love the water view with a shoreline not too distant. Take note of the firepit for making smores with the kids. The lake is heavily tree lined and spring fed. It's a fantastic "Best Kept Secret" Have a larger than 7 group? We have additional homes. Corporate events, re-unions and weddings are common. On your mark, get set, go!!! Head in after a day of fishing or tubing. It's time to start winding down! Just in case you have any energy left you can enjoy a game of basketball on our full court. Enjoy your favorite beverage at the end of a fun filled day. The westerly exposure creates some stunning sunsets. All can be seen from the comfort of the shaded porch. Night time is a beautiful time on the lake. The property lights up all the way from top to bottom. 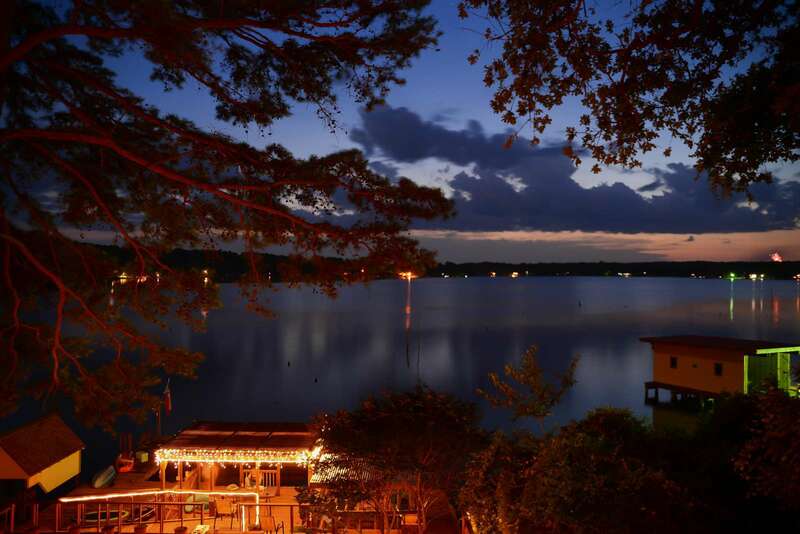 The view and quiet nights on the lake seem to be a favorite with our guests. Note the fireworks on the right side. 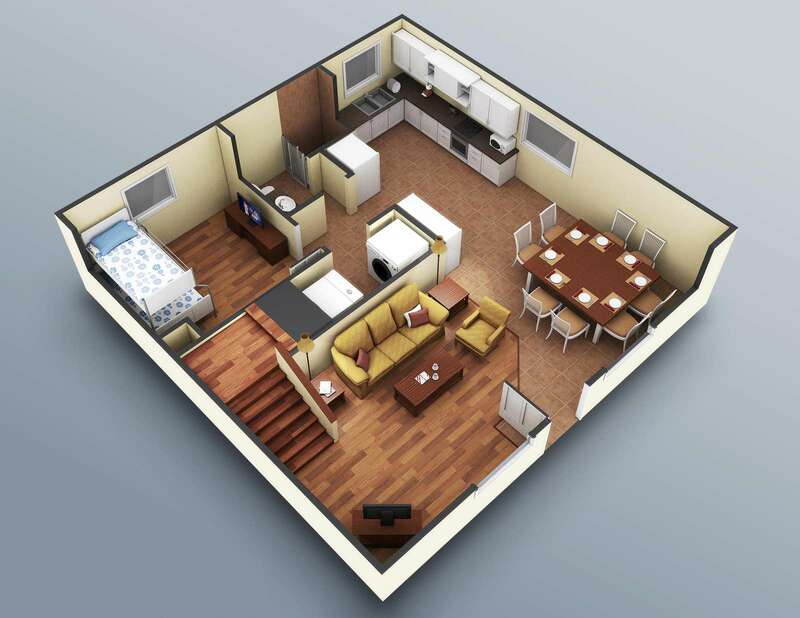 The lower level rendering. Accurate down to the furniture placement. 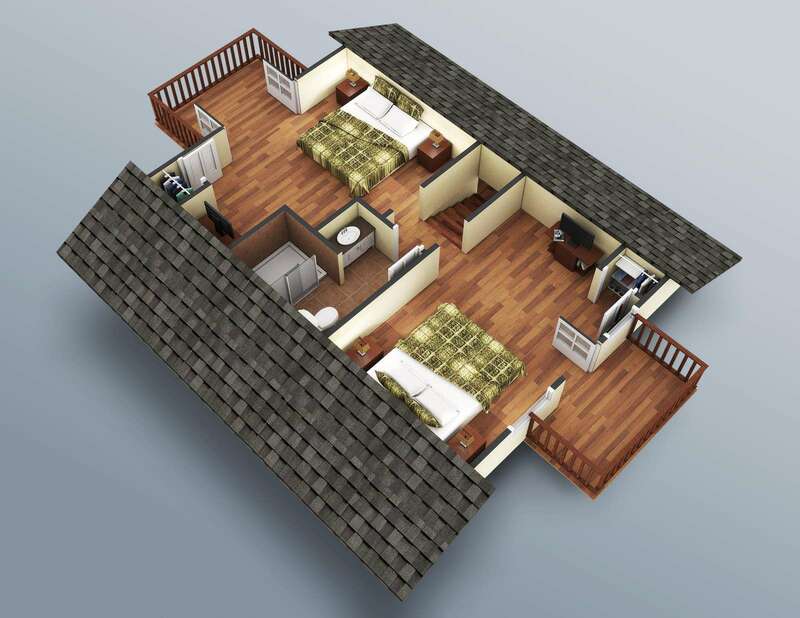 The Upstairs rendering. The living area looking into the dining with the kitchen around the corner! Looking into the kitchen from the dining area. The well stocked kitchen with granite counters. The lower level bathroom with shower. The lower bunkroom. All bedrooms have T.V. and Cable. Upper floor bathroom The lakeside Bedroom with balcony overlooking the lake. The second bedroom with balcony. All bedrooms have T.V. and cable The upper bathroom with shower. 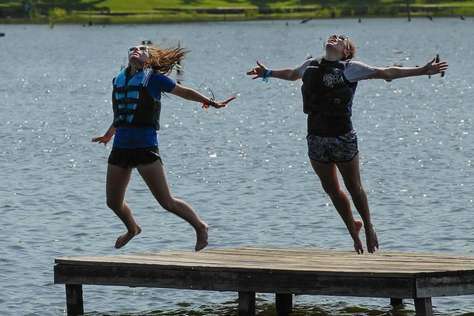 If you want to have affordable family fun on the lake, this is your home! Awesome View offers amazing views (hence the name) from it's huge shaded decks and sunny docks. Sit under the cabana and enjoy the breeze from the lake and ceiling fans while relaxing with a tablet or book. You could go down to the huge dock that sets over the lake and play in the water with your own complimentary kayaks or floats you bring along with you. 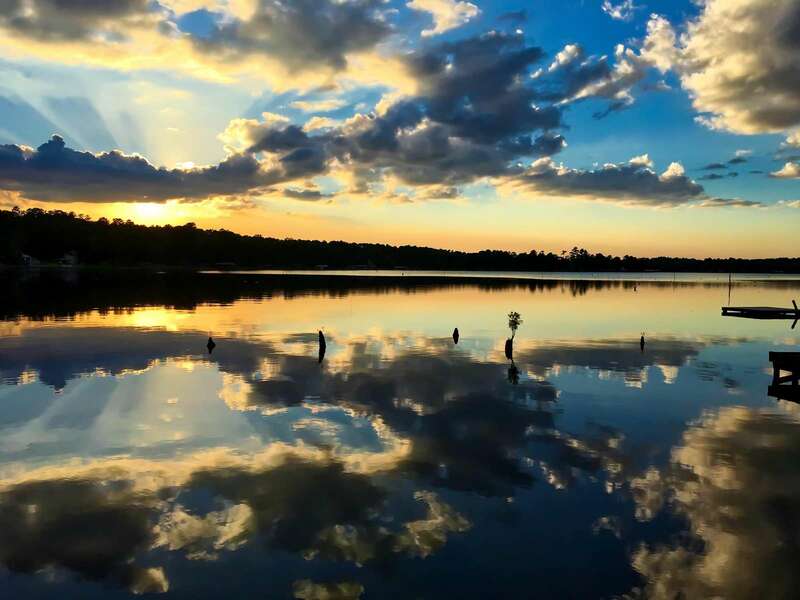 Houston County Lake is a spring fed lake that stays close to level in all but the direst of times. Maybe you'll bring your own boat (or invite a friend that has one :-)) for fishing or recreational boating, the main part of the lake is a short 3 minute ride and great for wake boarding etc.. 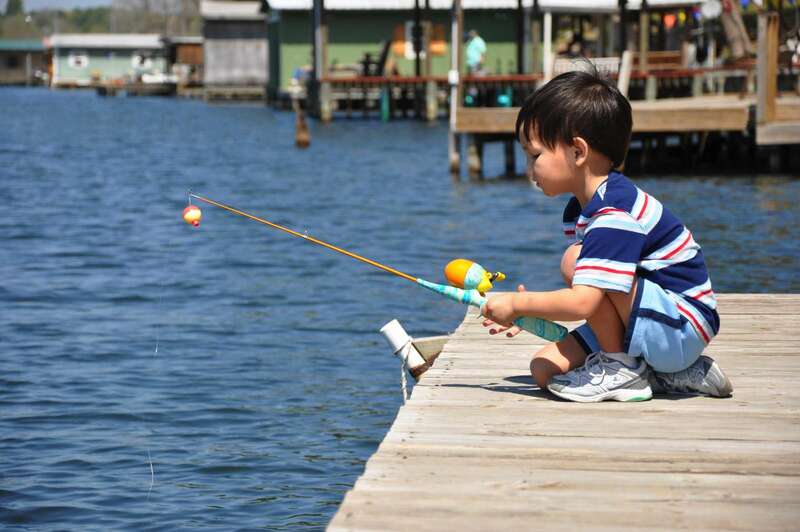 Fishing off the dock is a favorite with the kids as well as the parent that's okay with relaxing on your own dock. During the warmer months the Sunfish and Perch are plentiful and are easily caught by the youngest of anglers using corn or worms. If you like to eat what's caught you have your own private fish cleaning station. The young, and young at heart are sure to engage in a competitive basketball game on our "almost" full court (bring muscle rub for the older folks) a short distance from Awesome View. While the kids are playing basketball you might take a short walk over to our small private park, "Tranquility Park" seems to be the name given it by our guests. Sit on one of the benches and watch the deer roam the neighborhood. At the end of the day it's time to head back to the Awesome View and fire up the gas grill, which is connected to a large tank which means you won't run out of gas in the middle of a meal. 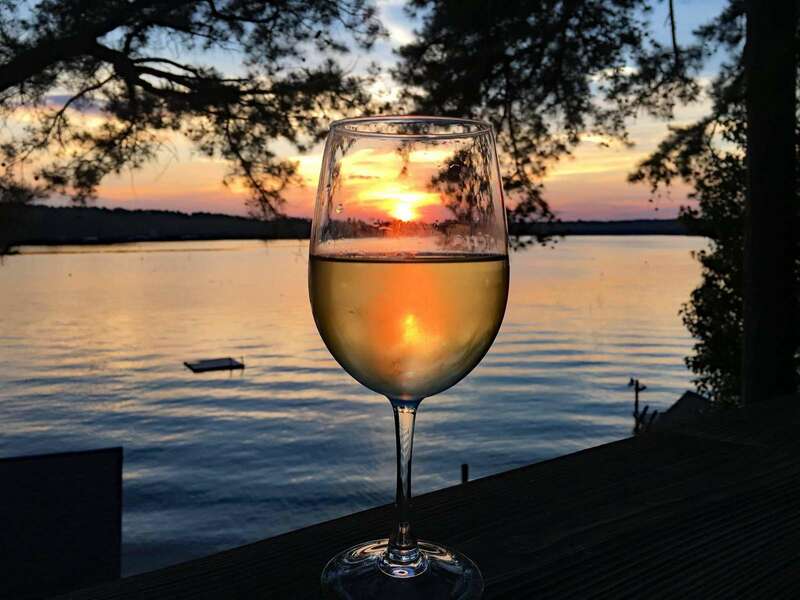 As the evening creeps in sit on the deck or dock and witness some of the best sunsets! The westerly exposure makes the decks and docks an excellent vantage point to enjoy natures finest paintings. As it gets darker it's time to get the kids, light the fire and make S'mores around the outdoor pit. The home comes with a complimentary stack of firewood. You'll surely enjoy the solitude of the lake and the impressive outside lighting the home offers at night time. You will love Awesome View and will want to return again and again like many of our guests! Learn more about the lake on the link below. The outside of Awesome View is so great we sometimes forget about the inside, which is no less impressive. The home has three bedrooms. Lets start upstairs. The Master is a queen and has a private third level balcony. It's a favorite with many that like to sip coffee and look at the lake or read. All the bedrooms have 32" televisions with cable. The second queen faces the front of the home (street side) and has a balcony overlooking the front gardens. It should be noted, the roads are very lightly traveled, well maintained dirt country roads. The tar county road is less than 2/10'ths of a mile away and the state highway, which is also lightly traveled is two miles away. Hey, you're in the country! There is a shared Bathroom for the two upper bedrooms Both Bathrooms are tiled showers. As you head down stairs you are in the living room which offers Netflix and a few other programs. The Dining Room sets to the side where you can speak to people in the Kitchen or Living Room. The D.R. 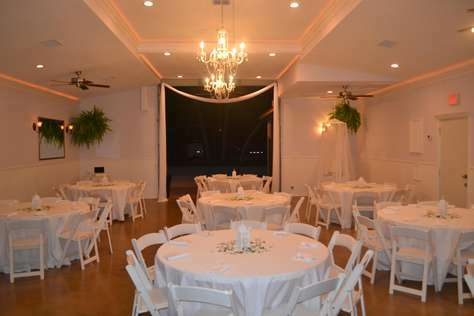 has a larger table that will accommodate your group. The Kitchen has all the utensils and appliances one needs to cook most meals. The counter tops are granite tile. There is lower Bathroom with granite vanity top and a tiled shower. Across from the Bathroom is the utility room with washer and dryer. The third Bedroom is a full over twin bunk. All bedrooms have 32" televisions with cable. Awesome View is located on a very quiet area of the lake. There are some stumps that eliminate most boat traffic. Fishing boats on trolling motors frequent the area leaving the noise of Jet skis and powerboats to the open areas, and yes, we love it this way. There is an easy channel access to the main lake that is a 3 minute ride. The home is equipped with complimentary kayaks (please wear life jackets). Additional homes can be rented allowing larger groups to utilize the outside areas. Check with us before booking please. We are here to help and can be reached via our contact page information. Any cancellations made 90 days prior to arrival will receive a full refund minus a $150.00 cancellation fee (per property). Cancellations taking place under 90 days and before 31 days will forfeit the initial 50% deposit. Cancellations taking place under 30 days will forfeit total payment. We do not allow rescheduling. We do not allow sub leasing. Bookings over 30 days prior to arrival require a ½ payment. Bookings under 30 days prior to arrival require a full payment. You will be notified approx. 32 days prior to arrival that the card on file will be charged in two days. Please notify us of any changes in credit card information to avoid any disruption. All correspondence will be with the email used in making the reservation. Any changes in the above procedure must be agreed to in advance and in writing, no exceptions. If we are unable to process the final payment (usually the 30 day) we will try every reasonable avenue to contact you. If we cannot contact you within 7 days the booking will be cancelled and the payment on file will not be refunded. Renters acknowledge that Vacation Country Rentals has the right to charge the credit/ debit card on file for damages to the home that are above and beyond normal wear and tear. Any loss or damage to any Vacation Country Rental property can be deducted from your credit card including, but not limited to the following: Damage to the property, home or yard. The number of guests exceeds that which is listed for the property. Excessive cleaning/laundry or rearranging furniture that has been moved, replacement of missing items from unit (including towels), soiling of towels, linens & carpets, boating items damaged or lost, costs of cleaning beyond the normal, costs to replace keys and misuse of items belonging to the property. Violation of our no pet policy and Excessive trash will incur charges. Pets brought into a non pet friendly home (Creekside is the only pet friendly home) or smoking will incur an automatic $300 fee for each violation. The property has an epic feeling tone and look. The owners are very accessible and customer friendly. This will be my place to stay every time I am in Houston County. 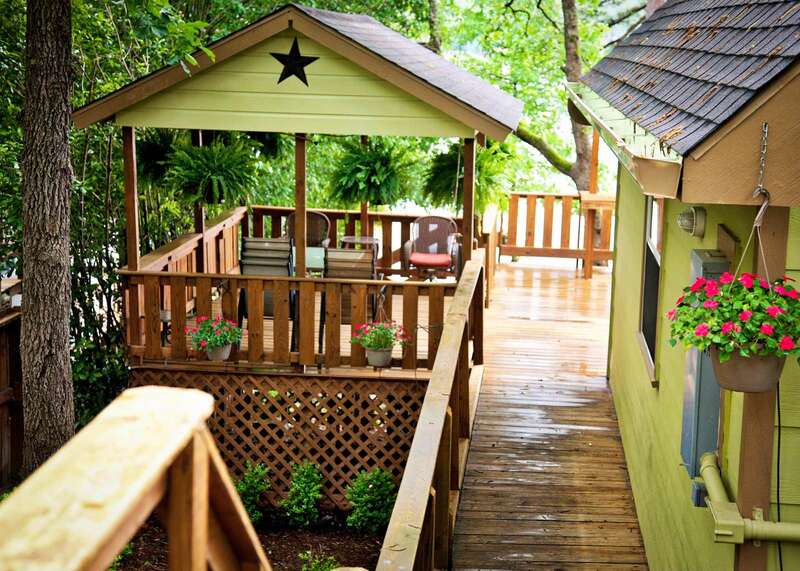 This couldn't be a better place for individuals or family members to relax and enjoy the peace and quiet, the sounds of nature, and beautiful surroundings of a lake environment. The descriptions and photos on the website are exactly what you get and well worth the price. The owners, Mark and Brenda, are the real deal and sincerely have the visitor's best interest at heart and want to provide an enjoyable stay. The property is VERY well maintained! We're going to stay at the Creekside next time to enjoy time in the woods with the deer. The drive from Dallas was very easy and not so long where the kids start to ask "when are we going to get there." A definite place to return to! This was our 4th year at Vacation Country Rentals, and our first year to stay at Awesome View. The house is appropriately named - the view is amazing. We lucked out and even got some gorgeous pics of the moon setting over the lake our last morning here. It had plenty of room for the 3 of us, and tons of deck choices for lounging, playing games, or just enjoying the view. Kudos to Mark and Brenda for building such a nice place for folks like us to share and relax. Great place to stay and play. We took the family (5 kids) for a lake vacation and that's what we got, a vacation. This is a fantastic place to visit and enjoy the lake. Decks to accommodate swimming, fishing, cooking or just relaxing. The location on the lake is perfect. Great for the kids to swim without boat traffic yet a short troll with our boat to the main part of the lake for wakeboarding. We all had a great time and appreciate the hospitality. We will return again and again. As always it was hard to leave the tranquility of the lake to return to the hustle and bustle of Houston. "Awesome View" was perfect as usual. We caught a few fish and enjoyed kayaking in the early morning and at sunset. 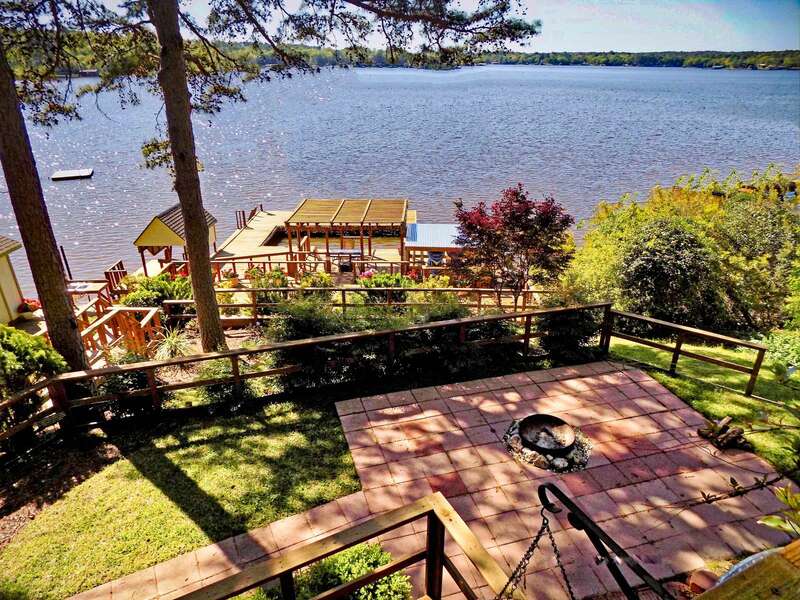 This property has everything you need for a perfect lake retreat. Cannot wait to return. Thank you Mark and Brenda for our little piece of "Paradise in the Pines". Stayed at Awesome View for the second time. The facilities are always spotless and outside areas are beautifully landscaped. This is our fourth stay with them over the past few years. Fishing was mostly about fishing and not as much about catching as in the past. Lots of rain prior to the trip had the lake stirred up. Hope to return again maybe in the summer or next spring. Like the name of the house, awesome view! Emaculate kept house. Everything you need for a fun, relaxing vacation. Stayed here for a weekend with some friends- had a great time and were very comfortable. Very pretty setting. Owners are very nice and pleasant. What an enjoyable time at Awesome View. The decking provided three areas (or five depending on how you count) for enjoying the outdoors. The weather was perfect for us and I greatly enjoyed watching the grands drowning worms. The Copus' were excellent hosts--helpful when you needed them but never hovering. We plan to return with the crappie in the spring. 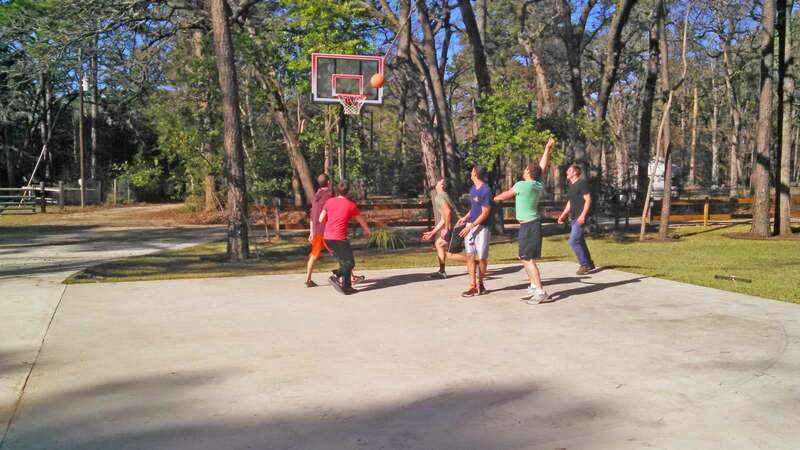 I spent the weekend with my son and two sons-in-law for a men's retreat weekend. Awesome View is aptly named, but the entire home is as comfortable as home. We didn't lack for any comforts, which allowed us to really concentrate on the purpose for our time away. I had a secondary "mission" for the weekend also...my wife asked me to check out as much of the other accommodations as possible, with a view toward a future booking for the entire family. Mark was very gracious in escorting me to a viewing of the two homes large enough to accommodate my whole family of 8 adults and 7 grandchildren. I was thoroughly impressed with the cleanliness and attention of home-like comfort in all of the places. We will not hesitate to book a stay at one of the larger homes for the entire family. Thank you, Mark and Brenda, for your hospitality and your attention to making this home-away-from-home a place to which we can look forward to returning. Awesome View is the perfect vacation home. 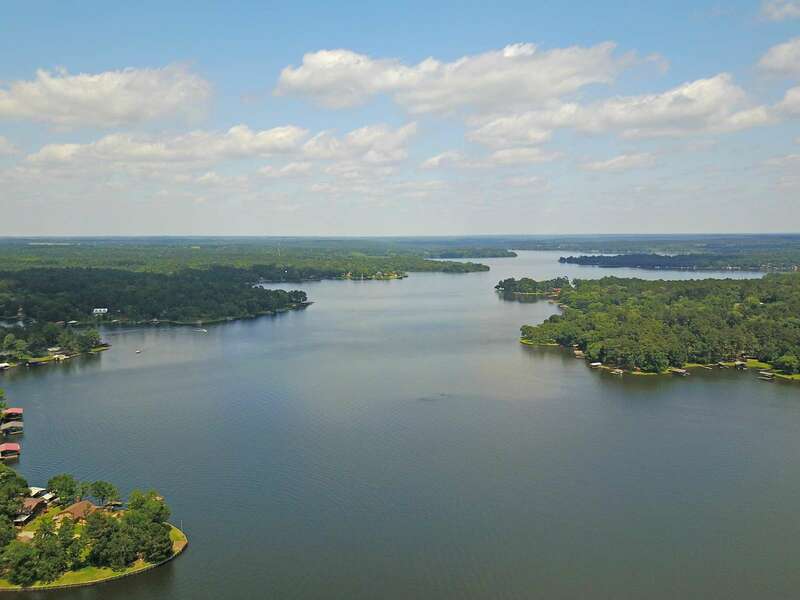 All the amenities of your own home with an absolutely Awesome View of Houston County Lake. I sty with Mark and Brenda Copus every trip to the Crockett area and bring my family along fro Spring Break and other vacation opportunities. The amenities they have are second to none and their hospitality is tops! 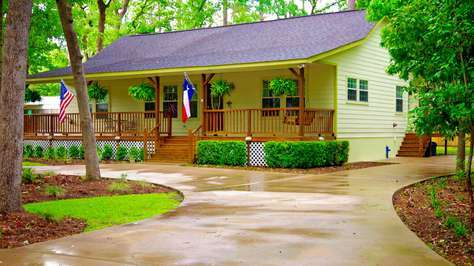 You can't go wrong with Vacation Country Rentals, all of their homes are excellent! We stayed here for two nights as a bonus stop over on our way to our family vacation, this place is AWESOME. The house was clean and had everything you would need for a comfortable stay however the real showpiece is the outside spaces, the top deck has two seating areas, one fully shaded, one level has a fire pit which I imagine would be fantastic in the colder months then the dock itself is just made for relaxing from sun up to sun down at which point the stars were amazing. Other little bonuses are the kayaks and various water toys available for use. Lastly, and worth a mention, is that we stay in a lot of vacation homes and always leave them in the condition we find them and until now have never received a thank you from the owners so that was a nice touch. Will definitely return one day. Our family stayed at Awesome View over the holiday break. The house was very clean and quite comfortable. We particularly enjoyed the outdoor areas, especially the fire pit, where we spent hours talking while we roasted marshmallows and enjoyed the view of the beautiful lake. We took daily walks around the neighborhood, enjoying the deer and a variety of birds. This property is beautiful and we hope to come back in the summer or early fall. Had a great stay and family really enjoyed it. We will be back after the first of the year when fishing is better. Thanks for everything. More than we imagined it would be! Mouth dropping gorgeous. Clean and fresh as the lake breeze. Weather was prefect and the surprising and refreshing misters on decks made for comfortable setting outside! Best family retreat! Thanks! Please Note: The misting system was a maintenance nightmare. We removed it and have not found a system that works. Everything at Awesome View was wonderful. We spent a long weekend and were not ready to leave. The property was just as advertised! 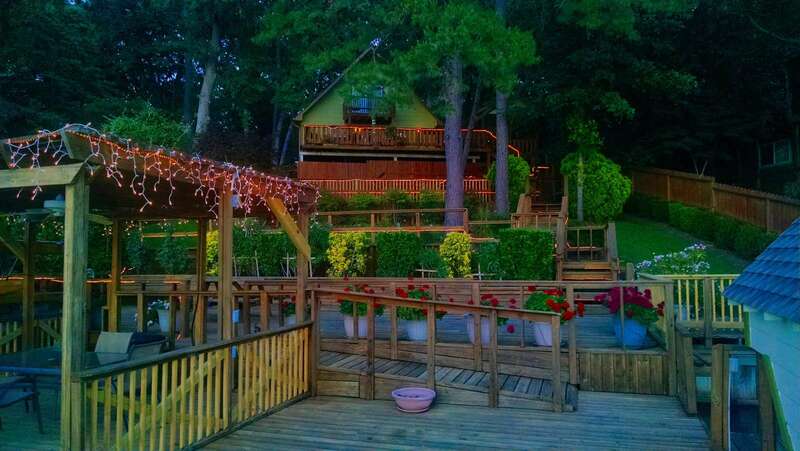 Great views of lake, beautiful decks for eating, relaxing, and fishing. We will definitely stay again. My family had a wonderful time during spring break! 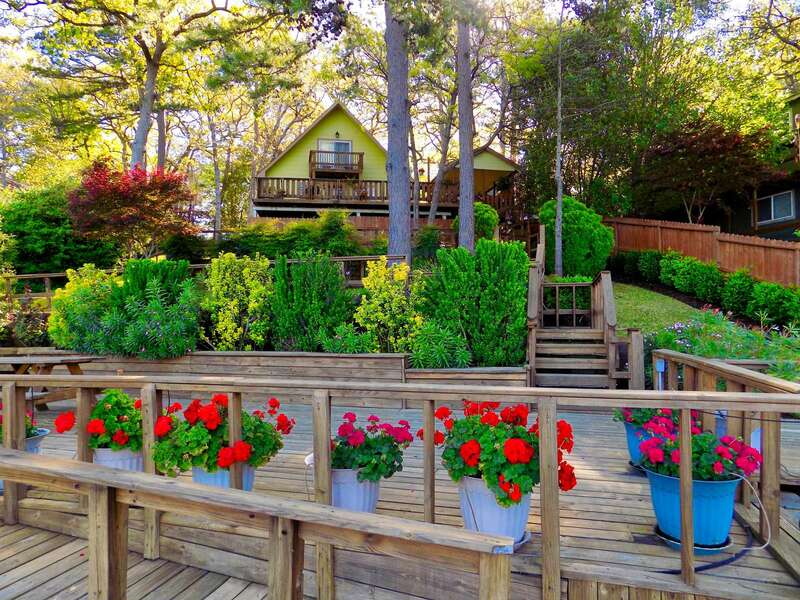 My children, grandchildren, and I truly enjoyed the relaxed comfort of the lake house...the different decks, walkways, dock were in immaculate shape, as well as the house itself. S'mores by the firepit were a special treat...great weather to enjoy the campfire! The kids played hide n seek, fished, and kayaked and even tried to swim in the too chilly lake waters...we will def. be back in the warmer summer months! Thank you so much ... Awesome View was just perfect!! We had a great weekend at Awesome View! 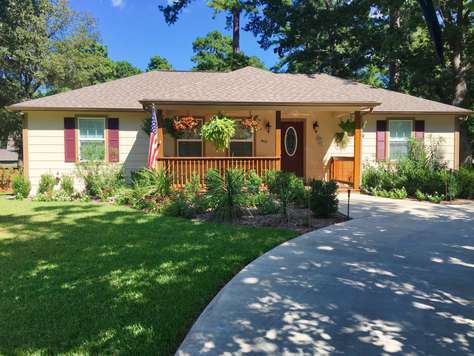 Wonderful house that is well maintained and clean! The kitchen is well stocked and there is lots of room on the property to spread out. We enjoyed the trees, birds and squirrels. In the hot August heat, we loved the misters on the pier to help cool us off. Mark and Brenda are fabulous hosts and very accessible. They have several other properties that are equally as nice. We will definitely be back! We had a great weekend at Awesome View! Wonderful house that is well maintained and clean! The kitchen is well stocked and there is lots of room on the property to spread out. We enjoyed the trees, birds and squirrels. Mark and Brenda are fabulous hosts and very accessible. They have several other properties that are equally as nice. We will definitely be back! We loved Awesome View. The home and view were perfect and our children loved the water and fishing. It was very quiet and relaxing. Just what we all needed for a mid-summer break. We will definitely be back. We (two couples) stayed at Awesome View for 3 nights and had a wonderful time. The house was spacious, and the decks and view were amazing. Although it was hot, we were quite comfortable sitting on the deck with the ceiling fans, enjoying the view. The kitchen was well stocked; we cooked a delicious meal on the gas grill one evening. We also ate at Moosehead Cafe and Tchoupitoulas in downtown Crockett. Mark and Brenda were great to work with. We would highly recommend Awesome View and hope to return soon! Please Note: Tchoupitoulas has closed, we were very sorry to see it go as it was our favorite. Myself and a group of friends decided to stay here instead of a hotel for a wedding we had in the area. Best decision we've ever made. The house is great, the yard is extremely well manicured, and we couldn't have asked for a better view at sunset. On top of that, we found out later from others in the wedding party that we were paying less per person for the entire weekend than what they paid per night at their hotel! My only regret was that we couldn't stay longer. If you're looking for a place in the area, look no further. We had a great time at Awesome View lake house! The view is gorgeous!! The house was comfortable, and has everything you need. Just show up & relax! The owners were great to work with, and made sure our stay was the best. Thanks, Mark & Brenda! We hope to visit again soon! We rented Awesome View for 2 nights and wished we could have stayed longer. The view is definitely awesome. The boat slips are very handy. We loved using the fire pit. Everything was spotless and well-stocked. We hope to be able to rent again soon! Amazing Property. Clean, Well Kept, Well Supplied. Owners were very nice to work with. The real highlight of the property is the back of the house/dock. We had plenty of room to sit outside and relax while taking in the "Awesome View" of the lake. There is no doubt in my mind that we will visit again. We had a great time. Nice cool water to dip into. Great fishing and it was just perfect weather. I will go back for sure. If you are looking for a great getaway, This is the place! Very relaxing, quiet and peaceful. Deer and other wildlife are abundant in the area. The fishing was great! Everyone we met were all very friendly and engaging. I can't say enough about the great hospitality that Mark gave us. The home was very clean, neat and Very well taken care of. Thank you so much for making our vacation a great and memorable time had by all. I would definitely recommend it to friends and relatives. The owner was very helpful and prompt with answers to any questions we had. Looking forward to going back!! We just spent a week at "Awesome View" ~ myself, husband, son and his friends and, had a wonderful time. The extra amenities that this house has exceeds all expectations. We have stayed in many vacation rentals & it is sometimes difficult to know if the description & pictures are accurate. Well, as the pictures indicate ~ this house is amazing. We turned on all the outside lights each night; lighting up the trail of deck stairs, lights around the lower water level decks and fishing lights made this house look so beautiful. We took out boat out one night and could see the house lit up from across the water ~ it was really quite something to view. Everything inside the house was also so beautiful. Everything you could possibly want in the kitchen. The owners Mark & Brenda were more than accommodating with all my questions & emails and eager to prepare for our arrival. The wood flooring in this home is beautiful; beds were comfortable with extra pillows & blankets; loved cooking in the kitchen; bathrooms & showers were great and decorated so well; provided beach towels (which we had forgotten). Everything was new & the home was very clean, something that's very important to me. The Flowers outside were so incredibly beautiful it was like being in your own private Sanctuary! There simply are not enough words to fully describe "Awesome View" and the comfort level it provides. We were in a melancholy state of mind when we had to leave and can only look to the future for a time to return to this wonderful and beautiful home. Thanks for sharing such a great place for our family and friends to spend our vacation at and we look forward to returning soon. I decided on the day of that my family needed to get out of Conroe for the weekend. I booked online and after talking with the owners Mark & Brenda Copus, arranged to stay at Awesome View. We headed out to Crockett and we loved every minute we stayed. It was really peaceful: My husband was off his cell phone and took our oldest son fishing as I lounged around with the baby. Stars at night, lake during the day..Who needs more? My wife and I rented Awesome View for a long weekend with our daughter, son-in-law and three grandkids (ages 3,5,11). It was a wonderful weekend - even with 100 degree days. Everything is as pictured in the ad and absolutely clean and well kept. The decks were a delight with misters and fans to keep us cool and in the shade. Grandkids caught lots of pan fish off the dock and we enjoyed the kayaks and 2-person fishing boat. 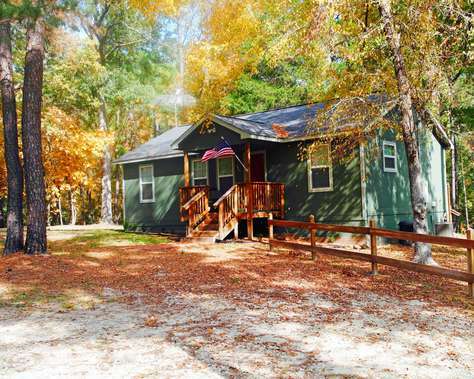 We hope to return for a fall trip and would highly recommend this property to others. really loved the fire at night. Everything was perfect. Thanks again! We had a wonderful week at Awesome View. It definitely has the right name. This place is a hidden treasure. The outside decks are the best part. Great for families with kids. The owners have taken great care to make this whole place feel homey and warm. All the flowers they have carefully placed all around the outside make it look so pretty. We were very impressed with the whole experience and will definitely return. They even provided floats and water toys. They were very friendly and helpful to us when booking and bent over backwards to provide answers to all our questions. We absolutely loved this place. A Happy B-day to Joan & Jean. Had a great girls weekend. Wonderful home to spent it in. Thank you so much. out on the deck and around the fire. We hope to be back! Getaway weekend. Mark & Brenda, Thanks for letting us use your wonderful home, for an amazing and relaxing weekend. We loved it here. It truly is an “awesome view” and we can definitely see why going back to Houston on Sundays will be difficult. Hope to return again! I had a great time at awesome view! I know my Dad loved it too because he grew up here! We went kayaking and boating and swimming! My cousin got three HUGE fish, I learned how to fish, Mom relaxed. Dad found a house he grew up in that looked the same as it did 35 years ago. My only complaint is that we didn’t stay long enough! Thanks Mark & Brenda for an awesome vacation. From Dad: The sunset views, the fishing, the decks and that cool lake I have always loved, every detail was perfect. You guys have done an incredible job and are wonderful hosts. We will be back! When we were making plans to visit - I thought, "3 whole days". The time went so fast - a weekend is just not enough time to completely enjoy Awesome View. I look forward to a return visit. Thank you for thinking of everything visitors would need during their visit. Your home was immaculate and the grounds were beautiful. We love your house, property and especially your wonderful hospitality. Thank you so much, we really loved family time around the fire at night. It was an Awesome family get together at Awesome View. Everything was perfect. We loved going into Crockett with its small town charm and really enjoyed Christmas on the Square. I highly recommend Awesome View to everyone. Thanks again! Wow, what an awesome place. The house is beautiful, right on the lake, with an absolutely inspiring deck down to the water. Sunsets across the lake were picture perfect. I found time to read, swim, and just plain relax as my wife and daughter did the same. We will definitely be back and will tell others about this place. Thanks for letting us stay in Awesome View. ©2017 Vacation Country Rentals. All Rights Reserved.